Praise the Lord and thanks for being supportive of the Lasting Impact Ministries and Gospel Tabernacle in the mission Jesus Has given us here in Uganda, Africa. -We are now installing our own electricity line. We had been getting our power sub-renting, and with the power shortages in the country, this is about to be phased out. By the time of the phase-out, we'll have our own lines. -We've also serviced our sound system for the first time in over two years and bought a blower as well. And we have new construction on the church and other improvements. On the March 24, 2007, we had the great joy of baptizing 25 new converts from the church, and as we normally do it was a day of prayer and fasting out by the lakeside. 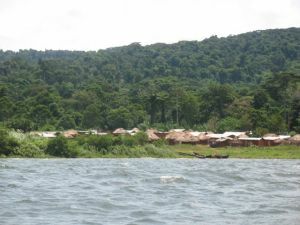 One of the most remote parts of Uganda is Buvuma Islands, which is made up of several smaller islands and a main island. The Lord has led us to help develop the island, and we are beginning with a school. Children there don't go to school for three major reasons, one of which is that teachers don't want to live on the island because it is too remote. The second reason is that parents cannot ride their children by boat to school on a daily basis or send them to go through forests which have wild game in them. And the third reason is that HIV-AIDS has affected the island so much, leaving a lot of orphans. Consequently, children that are old enough to brave the conditions are also old enough to fish and just go into fishing instead of learning. Our plan is to build a boarding school with an elementary and middle school boarding facility where parents only have to drop and pick their children once every four months. This will help them look at education as achievable. We plan to have school affordable for everyone. And we plan to have good accommodations for teachers and very good pay so they can stay in the now remote area. Please pray with us as we get moving and if you are led to support us in any other way, you are more than welcome to do so. April highlights of the ministry included the film ministry reaching out throughout the Easter holidays and a Gospel crusade held very near the church. Also, a women�s conference was held at the church in the last week of April.